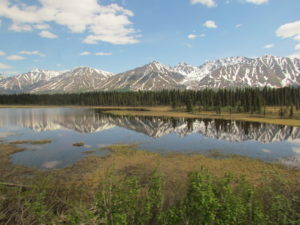 Denali National Park and Preserve defines the Alaskan Experience. Towering above it all is Mt. McKinley, the highest point in North America. At 20,320 feet, its summit beckons more than 1,000 climbers each year who brave the elements for the chance to scale its majestic face. Denali encompasses 6 million acres of forests, tundra, glaciers and mountains. Moose, caribou, sheep and bears free to roam a wide area of land untouched by man. There are ample opportunities for animal watching, whether it is a grizzly foraging for berries or a golden eagle soaring through the crisp, clean Alaskan air. Denali is one of the few places where visitors come in contact with the Alaskan tundra – a “vast, rolling, treeless plain.” The tundra starts at 2,500 feet and extends up along the massive Alaska Range. Muldrow Glacier, which descends 16,000 feet from the upper slopes of Mt. McKinley, comes within one mile of the road.